A few days ago, I was rummaging about in the cellar, looking for something, and I came across my X-C skis. They are the old wooden kind that you had to wax every time you used them depending on the weather and conditions. I also found my bamboo ski poles that I had used occasionally, when the ice replaced the snow in the yard. Then, there were my old shoes that I could never fit into now! Over the next few weeks I started to think about all the X-C skiing that I once did. Mostly here in town, with friends, the kids or the dogs, on ski trails or bush-whacking here on our property (before the era of cell phones, horrors!) 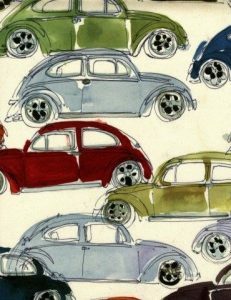 I recall one specific winter when we had purchased an old VW bug from a neighbor. It was orange and beat up enough so that a few more dents or scratches didn’t make any difference. A good car for us! For a number of years a friend and I ran a Bill Koch ski club here in town for kids and we would meet every Saturday at the local school. From there we would ski all over, on ski trails that were in existence everywhere then. Somehow, we managed to fit three to four people in the VW along with our ski equipment. No big deal! One particular Saturday, Gael was getting ready to drive to Florida to visit his brother and the kids and I were getting ready to go to the Bill Koch Club to go skiing. Gael’s parting comment went something like this… “If the car won’t start, crawl under the car and hit the starter with a hammer”. No problem. It sounded easy enough. Gael leaves and we get into the VW. It won’t start. So I crawled under the car and looked for the starter. I wasn’t sure what I was looking for, so I called a neighbor who came over and we proceeded to crawl under the car together with a hammer. He showed me where the starter was, hit it and I crawled out, got into the car and it started. Whew! I thanked him and we drove off to our skiing afternoon. 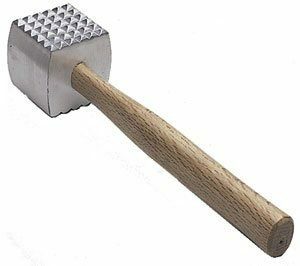 For the next few weeks, I carried a blanket and a hammer in the car and had to use it quite a few times, but it always worked. I also dis-covered that, with a push from someone or something, I could usually jump start the car that way. Another reason for having kids! If I had to venture out of town to the grocery store, I usually took our son and quite often a friend of his with me, just in case! I would park in the grocery store parking lot in such a way that, with a push from the two boys, the car would start. It usually meant that the boys would have to go into the store with me, but we separated when inside, me to get the groceries and them to do something to kill time. One time I happened to see rolls of toilet paper being tossed over isles and I know they had found something to amuse themselves. I don’t remember what happened to that car or what replaced it. 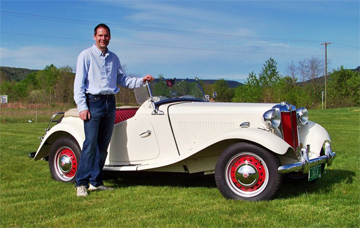 It might have been another VW bug with the driver’s seat on a piece of plywood or a Saab that came from Joe Kaelin. Both of these cars have unique stories to go with them. I’ll save those for another time. I have not received any questions this month, so I will give an update on the MGB project I am helping the high school student with. When we adjusted the valves, I was able to use my camera scope and explain how a four cycle engine works. The principle of the carburetor operation was easy to understand while rebuilding the carburetors. I have taught her how to rebuild the brake master cylinder, the brake calipers, and the clutch master. I have taught her how to cut and form metal brake lines, make bubble flares with a flaring tool, replace brake pads and brake shoes, and how to adjust drum brakes. Together we replaced the kingpins in the front suspension. Taking the suspension apart, I was able to show her how the suspension worked. She got hands on experience disassembling, rebuilding and then reassembling the suspension. We disassembled the generator, soaked the bronze bushing in engine oil, dressed the armature, replaced the brushes, cleaned, paint-ed and reassembled it. We polarized it, then tested it before installing it back on the car. More hands on experience was to be had when I walked her through how to replace the wheel bearings. She was able to knock out the old bearing cones and install the new ones. This was followed up with packing the bearings and installing new grease seals. We even successfully banged out a good size fender dent. We may weld in new floor pans and rocker panels. I am so impressed with how quickly she is able to learn new skills, and master these tasks. All through the project she is learning how to properly care for tools, and keep all the parts well sorted. We are carefully saving all of the old parts, and every work session ends with carefully wiping the tools down with a rag, then putting them away, clean. 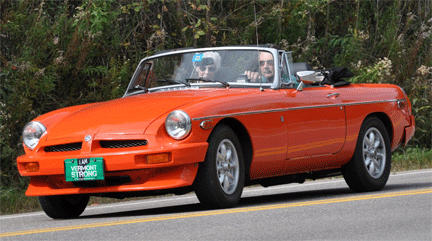 The MGB is a great car to learn from. It is simple enough to use as a model for explaining and demonstrating how the systems of a car work, yet modern enough to be relevant. 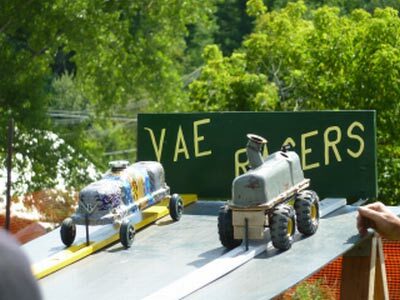 We need to continue projects like this one to keep our youth invested in the hobby. 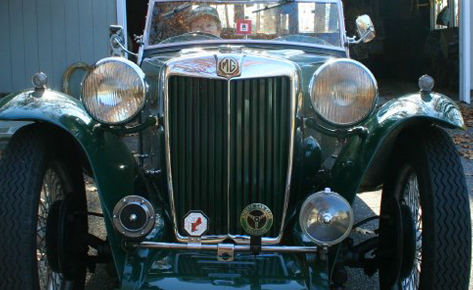 In a few weeks this MG will be ready for her to drive it to school. Amazing, considering the car had been parked outside for years before she was born, and has sat idle her entire life. Yup, the calipers both looked like the one on the right, now they look like the one on the left. Cleaned, and new pistons, seals and dust seals. Donald and Anne Pierce found this 1930 Ford Model A in the 2015 VAE car show “Car Corral”. The purchase took them back another 25 years, toward the beginning of the auto era for them. 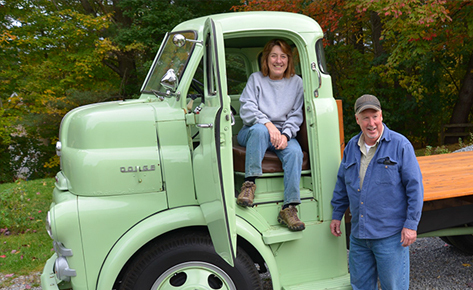 Their oldest at that point was their ’55 Dodge panel Truck. 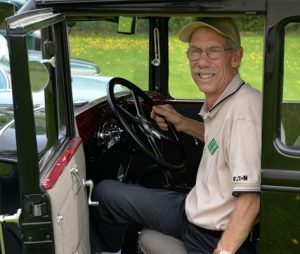 Don’s Model A was restored by John and Chris Center of West Rutland in the 1980s. 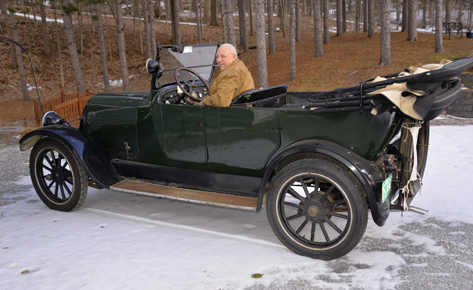 Don purchased the car from Bill Pinkham of Monroe, New Hampshire. He had wanted an older vehicle and is very happy with his Ford choice. It’s a very reliable car, he says. The Ford Model A was the second huge success for the Ford Motor Company, after its predecessor, the Model T. First produced on October 20, 1927, but not sold until December 2, it replaced the venerable Model T, which had been produced for 18 years. 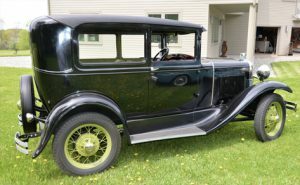 This new Model A (a previous model had used the name in 1903-04) was designated a 1928 model and was available in four standard colors. By February 1929, one million Model As had been sold, and by July 24th, two million. The range of body styles ran from the Tudor at $500 (in grey, green, or black) to the Town Car with a dual cowl at $1200. In March 1930, Model A sales hit three million, and there were nine body styles available. Model A production ended in March, 1932, after 4,858,644 had been made in all body styles. 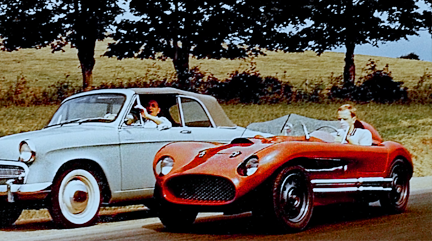 Its successor was the Model B, which featured an updated 4-cylinder engine, as well as the Model 18, which introduced Ford’s new flathead (sidevalve) V8 engine. There were 376,271 Tudors built in 1930. They weigh 2348 pounds and the L-head 4-cylinder engine produces 40 brake horsepower at 2200RPM (rated horsepower is 24)… see footnote. Footnote… What is the difference between rated horsepower (HP) and brake horsepower (BHP)? Horsepower was figured “back in the day” when, mostly, four legged creatures were used. Invented by James Watt, one horsepower originally was measured by the amount of work, that a horse lifting coal out of a coal mine, could do in a minute. Back then, one HP equated to 33,000 foot-pounds. So, what is BHP? Well, if you take all the items off the car that the engine needs to power, like the transmission, the water pump, the generator… everything , you have an engine with no work to do and all kinds of extra power. That is brake horsepower. 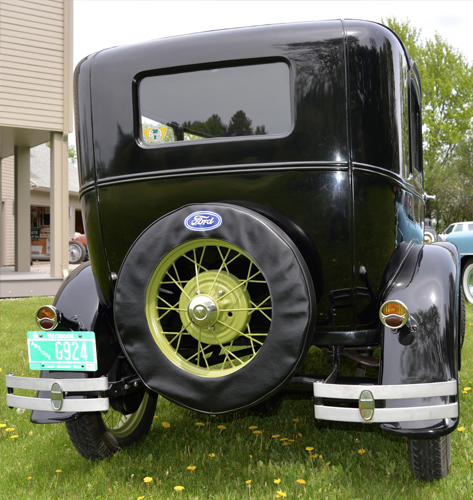 This Model A Ford needs 16 of its horsepower, out of the 40 HP it produces… just to sit and idle. The House of Tudor, the royal house of Welsh and English origin, descended in the male line from the Tudors of Penmynydd. Tudor monarchs ruled the Kingdom of England and its realms, including their ancestral Wales and the Lordship of Ireland from 1485 until 1603. Henry Ford thought that was cool. It was a marketing ploy. 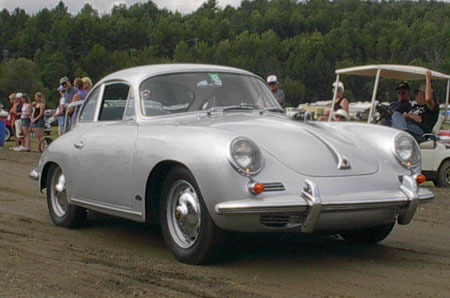 Manufacturers had pet names for different body styles. 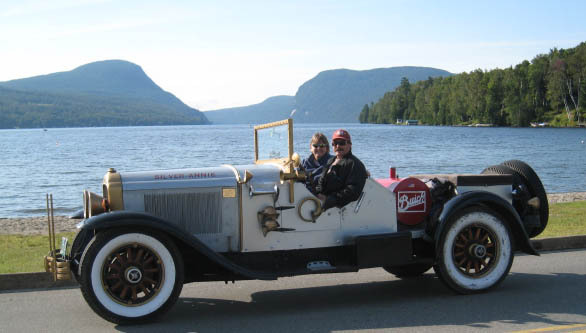 The model T touring car became a phaeton on the model A. It sounds better. The tudor (2-door) and fordor (4-door) were marketing terms designed to stick in the minds of the public.